BlackBerry revealed a number of new products and devices during its AGM yesterday. The massive 3-row QWERTY BlackBerry Passport will arrive in September. while the BlackBerry Classic and its iconic “belt” of navigation keys will follow in November. John Chen, BlackBerry’s CEO, stated the company currently has 160 million registered BBM users around the world, but only 85 million of them are active every month. 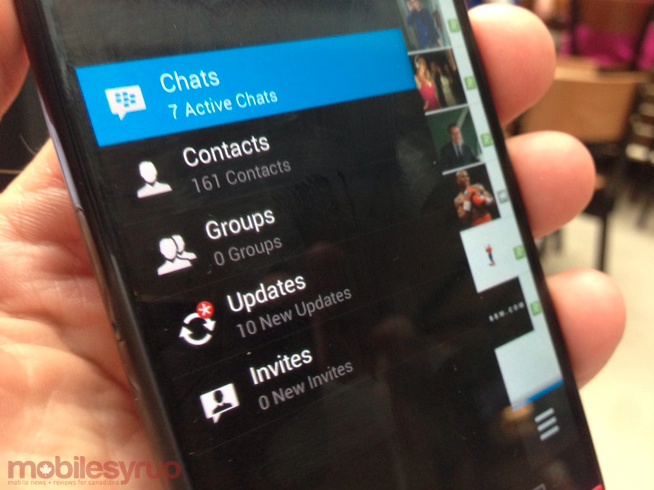 BBM is currently available on BlackBerry devices, iOS and Android devices, with a Windows Phone release scheduled in July. In addition, Chen stated the company has big plans to monetize BBM into a serious revenue driver. Part of this plan is the expansion of BBM Money in developing markets, and further rolling its eBBM Suite. 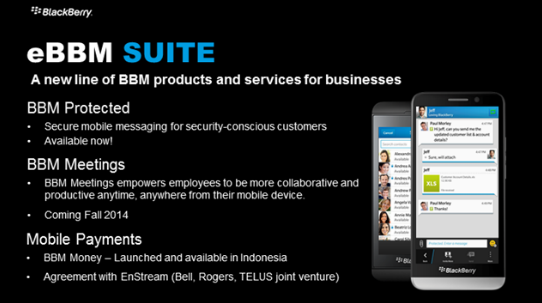 BlackBerry recently launched eBBM, its secure BBM app for enterprise, with BBM Protected. Coming this September will be another tool targeted to enterprise, BBM Meetings. The slide below says, “BBM Meetings empowers employees to be more collaborative and productive anytime, anywhere from their mobile device.” Seems like this will be something like a secure BBM group chat, hopefully with BBM video included.